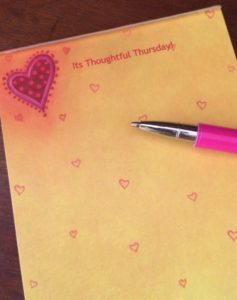 It’s Thoughtful Thursday! This gift is always “enough” ! It’s September 1st and while others are mourning the loss of summer I am relishing that things will get back to a regular rhythm. The kids are back in school (or in my case the grandkids), there will be some really gorgeous fall days and crisp mornings and I, for one, am ready for the change of seasons. Our family will kick off the fall by celebrating my Dad’s 90th birthday. I cherish this time I have with my parents and know that each day is a gift. Except for some hearing issues and forgetfulness my parents are doing well. The internet and “the facebook” baffle my Mom. My Dad does know how to send an email or play solitaire on his computer. Downloads confuse him but then they sometimes hang me up as well. My Dad requested no gifts for his birthday. He just wants to be around family. I actually had to convince him that a family gathering would be nice ( he didn’t want a party). In the end it was a matter of semantics as we are having a party but not using the “p” word. Despite my mothers confusion about computers she is aware of Amazon and will ask me to order things. Recently it was a gift for a friend who is turning 90. My mother was concerned it wasn’t “enough” of a gift. We have all been down that road before. I really dislike the notion of any gift not being “enough”. Who decides what is enough? My parents are actually pain relief going to the party which in my mind is gift enough but my mother would not let it go. Finally I came up with the perfect addition to the gift. Feel free to steal this and use this as we approach the holidays. It is definitely the quintessential one size fits all and will be universally loved by all who receive it. I told my Mom to write Sylvia a note and include all the special memories they have shared and why her friendship and connection through these many years has meant so much. It is one thing to know this. It is one thing to verbalize it. Having it written down adds a new dimension. It can be read, and reread, held close to the heart and touched. Running a hand over a written note can be soothing and a connection can be felt to the words and the time and sentiment that went in to writing the words on paper. I’m pretty sure something like this can’t be bought at Amazon…or at any store. Not to spoil the surprise but I know what I want to give and receive as a gift these coming months..and it is more than enough! Now you know what to do…go out and make it a Thoughtful one! !